- Beautiful 7 inches IPS display and 1.3 GHz quad-core processor. Available in four colors. 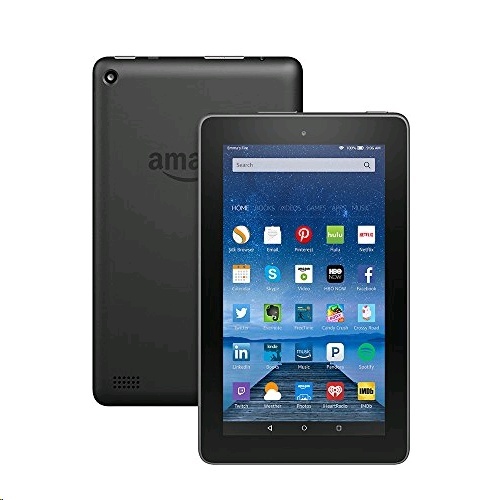 - Now with the Alexa cloud-based voice service - just press and ask - Enjoy millions of movies, TV shows, songs, Kindle e-books, apps and games - 8 or 16 GB of internal storage and a microSD slot for up to 200 GB of expandable storage - Prime members get unlimited access to a huge selection of songs, books, videos and more - Up to 7 hours of battery life [Fast and responsive] The fast quad-core processor consists of four high-performance 1.3 GHz cores for quick app launches, smooth games and videos, and great overall performance. [Power when you need it] Don't be tethered to an outlet—with up to 7 hours of mixed use battery life, Fire gives you the flexibility to go wherever the day takes you. [Beautiful 7" IPS display] Fire features a 1024 x 600 IPS display with 171 ppi for a bright display with vivid colors and whiter whites. Enjoy a great viewing experience at all angles through a combination of IPS (in-plane switching) technology and an advanced polarizing filter. [Capture life's moments] Fire features a 2 MP rear-facing camera for taking photos or recording 720p HD video. The front-facing VGA camera is perfect for Skype calls with friends and family. [No more worrying about storage space] Keep photos, movies, and compatible apps and games with you using a microSD card slot to expand your tablet's storage by up to 200 GB. Plus enjoy free unlimited cloud storage for all your Amazon content and photos taken with your Fire device. [Stands up to everyday life] Amazon engineers Fire tablets to hold up against everyday life. As measured in tumble tests, Fire is almost 2x more durable than iPad Mini 4.